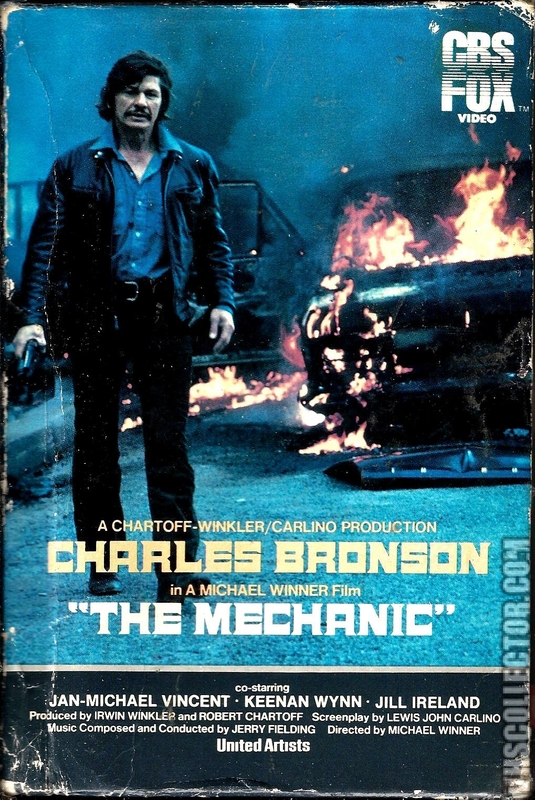 Arthur Bishop (Charles Bronson) is a "mechanic" — a top hit man (assassin). 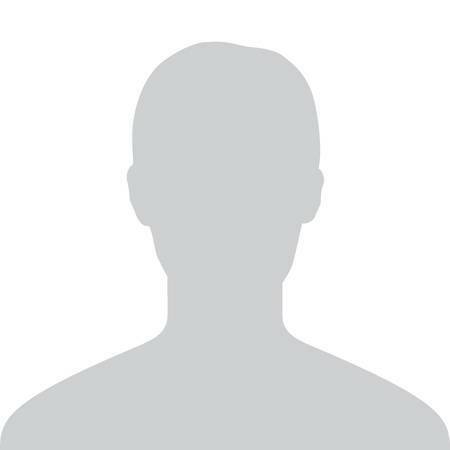 He works exclusively for a secret international organization, which has very strict rules. Bishop is very sophisticated, as he regularly listens to classical music, has an art collection, and is a connoisseur of fine wines. However, he is forced to live alone - he cannot show emotions or trust people. Bishop is under constant emotional pressure, so much so that he is prescribed medication for depression, and one day he is temporarily hospitalized when he loses consciousness as a result of the stress. Bishop pays a call girl, portrayed by (Jill Ireland), for an ongoing girlfriend experience to have a simulated romantic (social & sexual) relationship, including her writing him fake love letters. 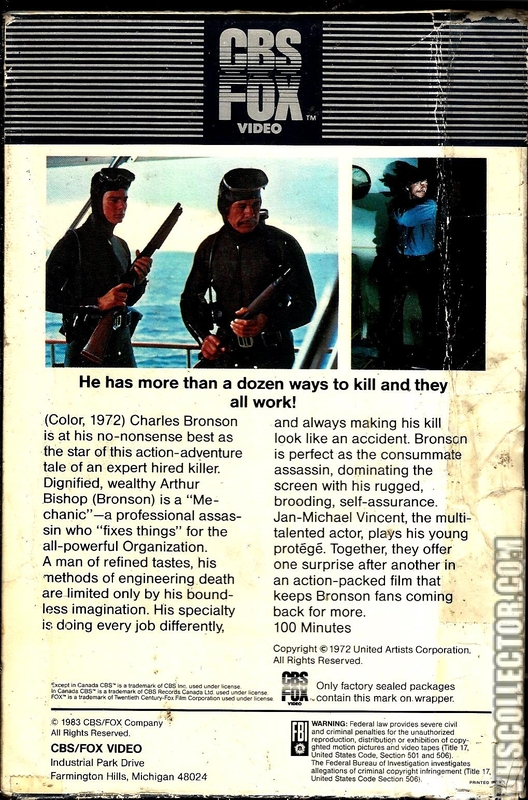 When Bishop is assigned one of the organization's heads, "Big Harry" McKenna (Keenan Wynn), he shoots at Big Harry, while making him think that the shots are being fired by a hidden sniper. Harry, who Bishop knows has a weak heart, runs up a steep incline, which triggers a heart attack. Bishop then finishes Harry off by smothering him. At Big Harry's funeral, Bishop meets Harry's narcissistic, ruthless and ambitious son Steve (Jan-Michael Vincent). Steve is intrigued by Bishop and seeks to find out more about him. Bishop is also intrigued, as he realizes that Steve has a personality suited for being a hit man, and plays along. Finally he makes Steve his apprentice. As part of his training, Bishop teaches Steve that "every person has a weakness, and that once this weakness is found, the target is easy to kill." But Bishop fails to get his superiors' consent for the arrangement. Following a messy assassination conducted by Bishop and Steve, the organization warns Bishop that his irresponsible choice to involve Steve has been interpreted as selfish behavior. The organization then gives Bishop an urgent mission, this time in Italy. Once again, Bishop involves Steve in the new plan, but just before they leave Bishop happens to find among Steve's belongings a file containing a lot of information about Bishop. This file is very similar to the files Bishop prepared for his targets. Nevertheless, Bishop allows Steve to go with him to Italy. In Italy, Bishop and Steve approach a boat where their intended victim is supposed to be, but it becomes apparent that this was a trap and they are the real targets. Bishop and Steve are ambushed, but they manage to kill all their would-be killers. His apprenticeship apparently complete, Steve shares a celebratory bottle of wine with Bishop, having coated the latter's glass with brucine, a colorless and deadly alkaloid. When Bishop realizes that he has been poisoned, he asks Steve if it was because Bishop had killed Steve's father. Steve responds that he had not realized his father was murdered. Steve taunts Bishop, saying "you told me that everyone has a jelly spot--yours was that you couldn't cut it alone." Steve goes on to reveal that he was not acting on orders to kill Bishop. Steve returns to Bishop's home to pick up the Ford Mustang he had left there. He finds a note affixed to the rear-view mirror, which reads: "Steve, if you're reading this it means I didn't make it back. It also means you've broken a filament controlling a 13-second delay trigger. End of game. Bang! You're dead." As Steve frantically reaches for the door handle, the car explodes.